In 1974 the Chevrolet Camaro saw a few significant changes. The body was stretched to be even longer and GM pushed up production significantly. Increasingly, the Camaro was finding itself more alone in the slowly fading era of muscle cars and their overall popularity. 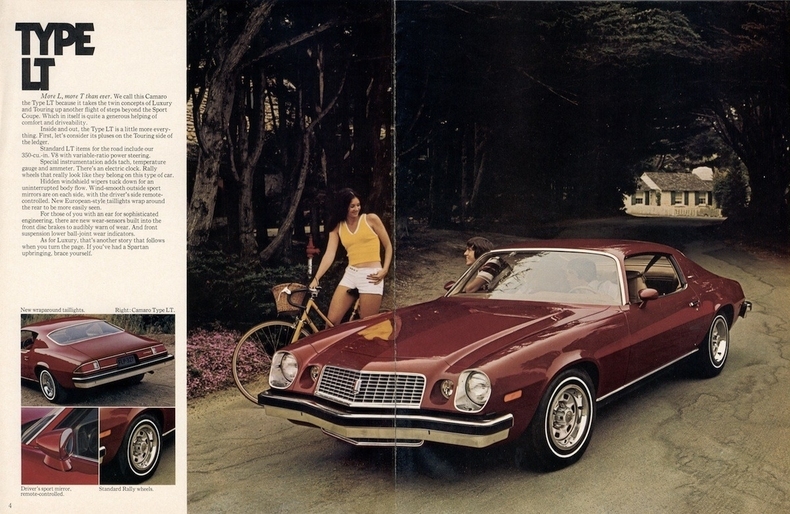 1974 saw the Camaro finally bow to federal bumper guidelines. This required a major facelift on the Camaro. Rather than place an I-beam ram on the front of the car, Chevy was able to tactfully craft a bumper which met the requirements and still looked relatively stylish – to some people. In addition to this, a new, now fiberglass front end nose was required. In the back, a matching aluminum bumper was used, along with wrap around teardrop style taillights. This change required a redesign of the rear quarter panel and trunk as well. 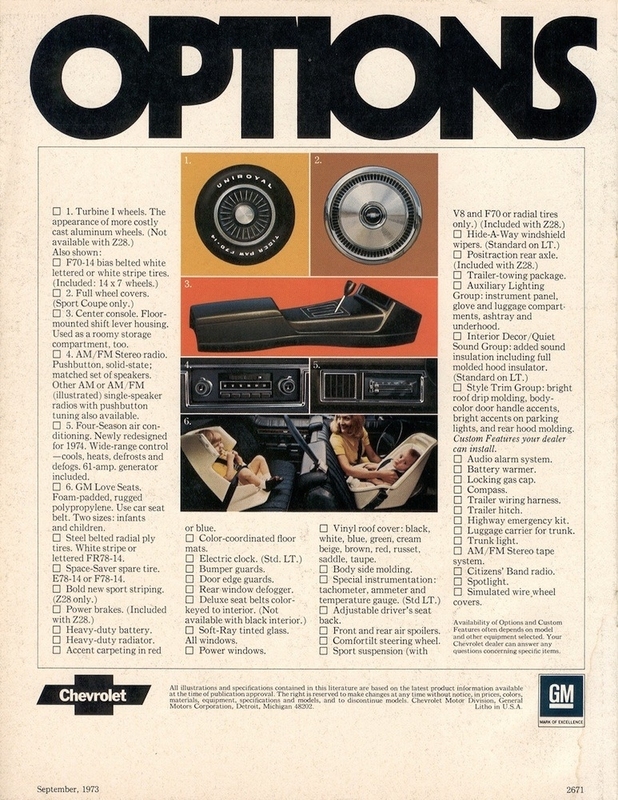 You might notice a lot of the changes being implemented are due to federal regulations, some of which were met with severe disgust by the car buying population. One of these was the ignition interlock system requiring your seatbelt to be fastened before the car would start. Others were the increasingly restrictive emissions requirements which caused engine power to be strangled. In an effort to pass fuel mileage requirements, gear ratios were raised which killed the acceleration potential of the car which was getting heavier & slower each year. 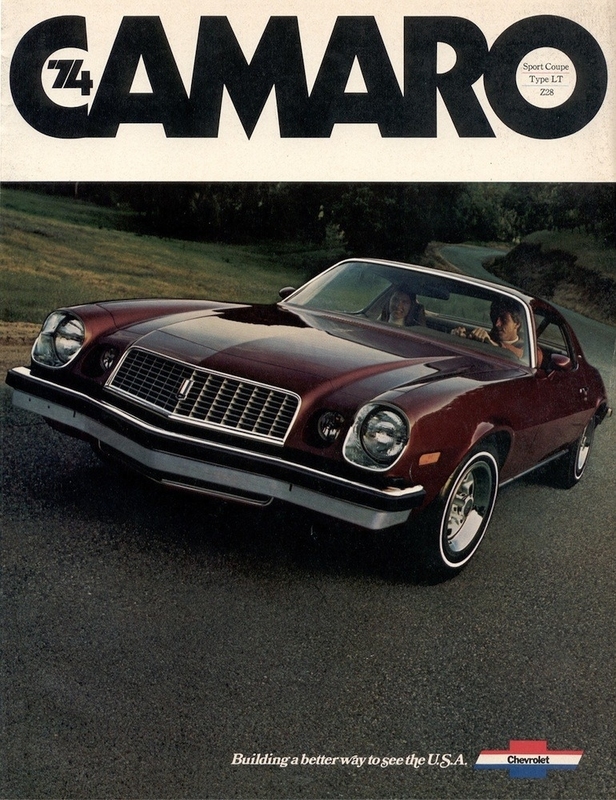 This is in addition to safety requirements/high Insurance rates, the cost of gas in an uncertain economy… These are some of the reasons why some people believe the “real” Camaro ended in 1973 (or 1971 depending on how you look at things), and for many people this era Camaro is often over-looked or forgotten. New extruded aluminum face bars supported on flat leaf springs. Front end, grill & head lights redesigned. Cut-in, wrap-around wedge-shaped tail lamps, eliminated the need for rear side markers. Power steering standard on all V8’s. Bumper jack changed to a tab-in-slot type (due to bumper construction). Gas tank increased from 18 to 21 gallons. Z28 got HEI in mid-season. 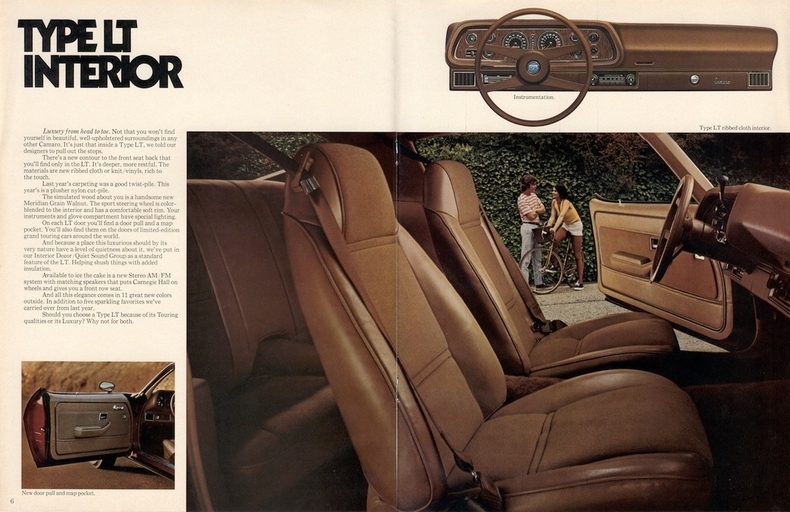 Includes body colored insert on door handles; bright roof drip, lock pillar, upper fender, hood panel and belt moldings plus bright colored trim ring and vertical bar on parking lights. Z28 Verification: The 5th digit of the VIN will read “T”. Period. Includes special 350 CID, 245 hp V8. Four-bolt main bearing caps, forged steel crank, impact extruded aluminum pistons, heat treated & shot peened connecting rods “big valve” cylinder heads with high speed valve train. Cast aluminum rocker covers with internal galleries. Hydraulic lifters cam & cast iron intake with EGR. Rochester Quadra jet. 17-quart cooling system with 18″ 7 blade flex fan. Oil pan windage tray and high speed crankshaft damper. Dual Exhaust pipe system. Same setup as 1973, HEI (high-energy ignition) introduced in mid-year (January 74). Special dual snorkel air cleaner with chrome lid. Click here to see the specific L-82 Engine Components. Weight saving aluminum gear cases for all 4-speed transmissions. Increased shift-points for Turbo-Hydramatic (TH400) transmission. 11-inch clutch. Same as 1973. Spring rate: 300 lb./in. Front stabilizer bar 0.938 inch. 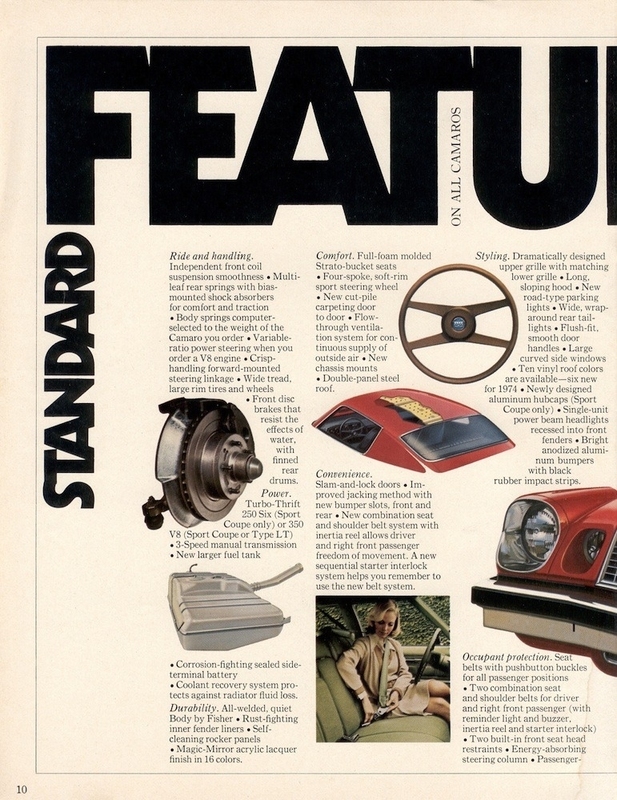 Unchanged from 1973. Spring rate: 89-99 lb./in. Rear stabilizer bar 0.69 inch. Unchanged from 1973. 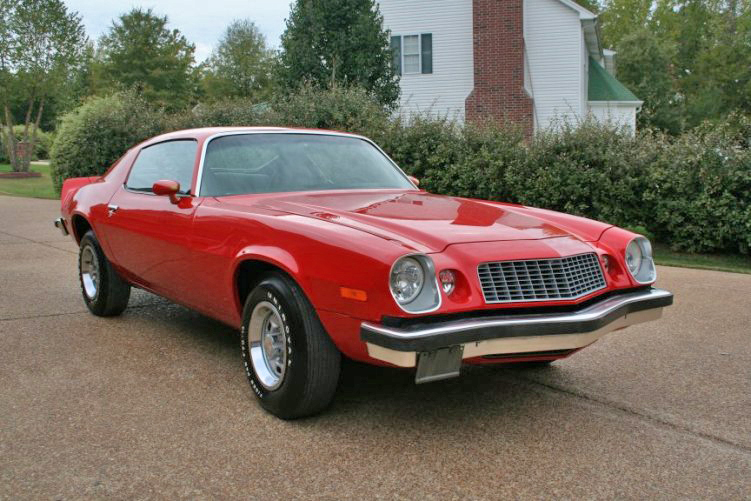 Click here to see the specific 1974 Z28 Chassis Specifications. New, big, 4-color hood and deck decals (RPO D88) optional. When D88 is specified “Z28” fender emblems are deleted. There’s conflicting information on where and when Z28 emblems are used when Type LT is ordered and/or special D88 striping is used. Z28 foil decal on rear end panel. Dual Sport mirrors (RPO D35) standard. Black-painted grille with bright argent outline. RPO Z28 dropped at the end of model year. Suspension (spring rates) on the Z28 seem to be identical to RPO F41, rear shock valving is different. 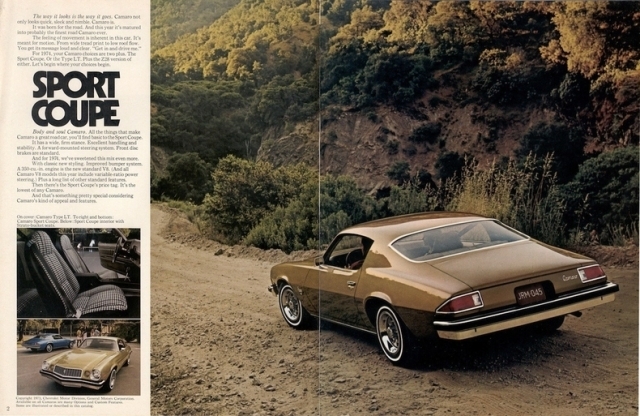 Z28 gets 15 inch wheels, different alignment specs (vs. base) and quicker steering (vs. base) Available on Type LT model. Plusher Interior with restyled seats and door trim in cord-ridge fabric or knit vinyl, new woodgrain treatments, color coordinated instrument panel, steering wheel and column. Amber-lite insulation blankets included in doors, rear quarters, roof/sail panels, behind rear seat, under package tray and under carpeting. Type LT could be ordered with RPO Z28. Seventh digit is N for Norwood assembly. Notes: L-65 350 V-8 not sold in California; LM-1 was available in California only. 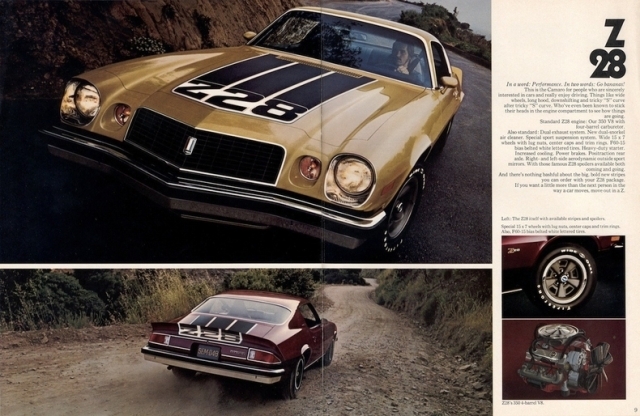 Z= Z28 special performance package. TH400 transmission code is CY and is stamped on a tag which is riveted to transmission case. * Option prices are retail for base model. 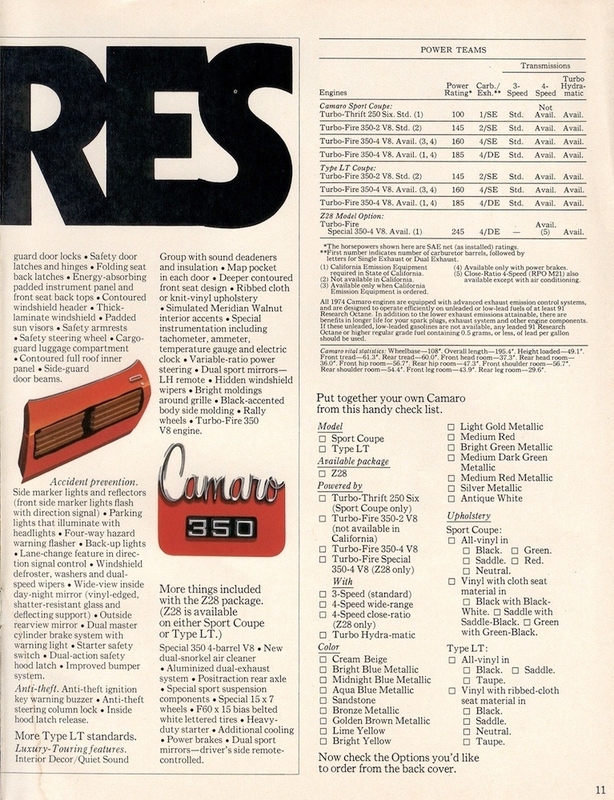 Prices could be reduced or option could be had at no charge if it was included as standard equipment on the Z28 or Type LT model. The trim tag, located on the cowl area identifies significant information about your car. Click Here for general trim tag decoding information. Codes 775,776 and 777 could each have black, red, or blue carpet. 777 could have black (code 19F) or blue (code 24F) carpet.